Heat oil, add cumin seeds. When it splutters, add cloves, cinnamon and cardamom. Fry for a minute and add it to the soaked rice. Add salt, turmeric powder and cook the rice. Heat another tsp of oil and add the chopped onions. Fry for a minute and add the pureed tomato. Add garam masala powder and allow it to cook for 2-3 minutes. Add the cooked chickpeas and mix well. Allow the mixture to get dry and finally add the cooked rice. Mix slowly to coat the rice with the mixture. Garnish with coriander leaves and serve with raita/chips of your choice. In a large bowl, sift the flour and baking powder together. In a small bowl, mash the banana with a fork and add 1/4 cup of the milk, mixing together until there are no lumps. Add the banana, sweetener, pine seed, blueberries, and remaining milk to the dry mix and stir together until "just mixed". Heat a nonstick pan or a lightly-oiled frying pan. Let sit on medium heat until the bottom turns golden brown. Flip and cook other side. Repeat process until all the batter is finished. Makes 2 or more servings. Heat oil, add cumin seeds. When it splutters add the masala paste and cook for 3-4 minutes till the raw smell goes off. Add turmeric powder, red chilli powder, garam masala powder, ginger paste and salt and water as required for gravy. Allow it to boil for few minutes. Add the paneeer pieces and cook for 2-3 minutes. Garnish with coriander leaves and serve hot with rotis/pooris/pulav. Just 3 more days for the WYF:Breakfast event to end-Last date is 31st August and no late entries please..Rush in your delicious breakfast ideas to win cookbooks.. In a large pot, sauté chopped onions in olive oil over medium heat. Open the tofu package and drain away the water. With a sharp knife, cut the tofu into small segments. Once the onions turn translucent, add the tofu blocks into the pot. With a potato masher or large fork, pound the tofu blocks in the pot until they turn into a crumble. The pieces should be smaller than 1/4" cubes. Stir the crumbly mixture with a wooden spoon. When there is little water left at the bottom of the pot, add the diced tomatoes. Do not allow the tofu to get dry or brown. When the juice from the tomatoes is reduced to a minimum, add the chopped coriander and spices to taste and for one more minute. Toast the bread slices. Apply butter or margarine to the toasted bread, spread a layer of tofu crumbles between the slices, and enjoy while it’s hot. Any kind of hot chutney, sauce or fries can be served along with it. Along with tofu cucumber, lettuce and tomato can also be used. Replace the whole wheat bread with bagel or focaccia. Tofu Crumbles mixture can be made in advance and refrigerated for up to one week. Recipe adapted from Cook and See book by Meenakshi ammal. Soak the cashews in hot water for 2 hours, drain and grind to smooth paste. Heat the sugar with 1 cup water and allow it to boil till two thread consistency. Add the cashew paste to it and mix well. Then add gram flour slowly and mix well without lumps. Add the food colour and keep stirring. Start adding ghee slowly and keep mixing it till the mixture starts frothing. Transfer to a greased plate and allow it to cool before cutting into pieces. Garnish with almond and cashew pieces. Heat the tortilla in a dry skillet, turning frequently, until it is soft but not crisp. Place on a large piece of plastic wrap. Spread with the vegan mayo. Place a line of the steamed broccoli and cauliflower down the centre. Add a line of the grated vegetables, dill pickle, barbequed onions, and top with the lettuce, sprout and avocado. Roll up the tortilla tightly, crepe-style, and wrap tightly in the plastic wrap. Store in the fridge until you’re ready to eat it. Cut the wrap in half, width-wise, and push the plastic wrap down partially, but leave one end closed to catch dipping sauces. For a dipping sauce I make guacamole and sour cream. Replace the flour tortilla with Khaboos(Arabic bread) or chapattis. Can add roasted nuts like pecans, almonds. 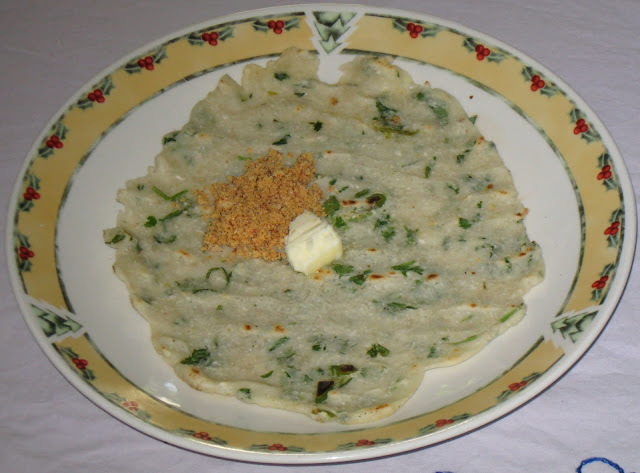 This is a very nutritional dish for breakfast made from Bottle Gourd and Rice flour. Bottle gourd is a veggie no one prefers but this dish no one can neglect. Try it out. First grate the bottle guard. Coarsely powder the jeera and pepper. Add the flour, coarsely powdered jeera and pepper, Ghee, coriander leaves and salt to the grated bottle gourd. As the bottle gourd leaves water, you need not add more water to make the dough. Mix all the ingredients well and prepare the dough to chapati dough consistency. Take a small ball and pat it on greased cold tava. Spread it like a pancake. Heat the tava and spread some oil around the pancake. Cook the pancake on both the sides till both the sides are brown and nicely cooked. This is Gauri's final entry for the WYF: Breakfast event hosted at this blog.. This is the best breakfast dish and my favourite. Can cook this recipe in about 5-10 min and everyone is happy. Here goes the recipe. Mix all the above ingredients in a bowl, add little water and make a dough like chapathi dough. Now spread 1 tsp oil on the cold tava and take a small ball of the dough and pat on the tava. Keep patting and making it into a small roti. Heat the tava, spread little oil on the sides of the tava and let it cook on one side. Then turn the roti and let it cook on other side as well. Cook until both the sides are brown. Serve hot with curds and dry groundnut chutney or butter. 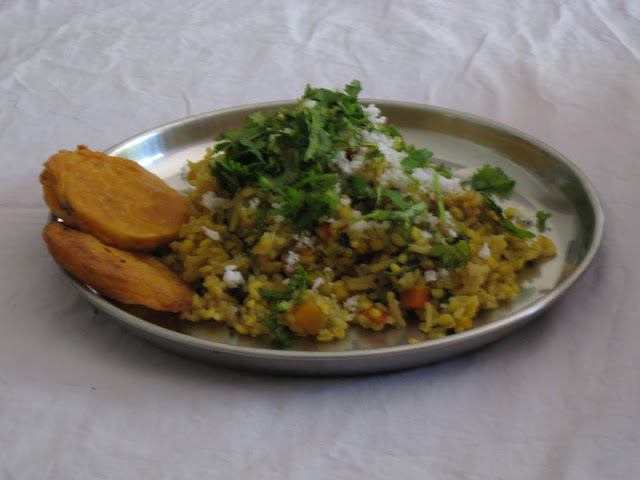 Thalipeeth is a Maharashtrian dish mainly eaten for breakfast. They are like rotis. They taste great and are of various types. This recipe is made up of cucumber and rice rava. 2 cups of Rice rava. Before making this for breakfast, make the dough previous night itself. Grate the cucumber and wait for some time till it leaves water. Now add the rice rava and mix well. Tightly stuff it in a vessel and leave it overnight. Next day morning add the crushed chillies, coriander leaves, salt and onions and mix it well. Now take a little mixture and pat it on a greased cold tava till it forms a round shape roti. Keep the tava on the gas and spread some oil and let it cook till brown on both the sides. Serve hot with curds and dry groundnut chutney or mango pickle. This pancake is called dhirdi in Maharashtra. This is one of the easiest breakfast which can be prepared in minutes. This includes rice flour, wheat flour and little gram flour and so nutritional and tasty. This can be prepared in any season and it tastes great. The recipe is here. Rice and wheat flour should be taken in equal quantities always. This can be changed as per the number of persons to eat. Dry roast fenugreek and cumin seeds and then make a coarse powder. Mix all the flours together and then add the finely cut onion and chopped coriander leaves. Add the coarse powder, salt and mix it well. Add water to get dosa consistency. Serve it hot with curds and dry groundnut chutney. how to make dhirdi, dirdi recipe, maharashtrian cuisine, quick breakfast, healthy and simple breakfast, how to make pancakes, indian pancake recipeThis is Gauri's second entry for the WYF: Breakfast event hosted at this blog..
Kozhakattai, Sundal and Payasam are the traditional offerings to Lord Ganesha in South India. Click on the name of the dish for the recipe. Kadubu is prepared in Karnataka as neivedyam..
Dry roast the wheat rava nicely till you get a nice aroma. Now pressure cook the rava till it is cooked well. 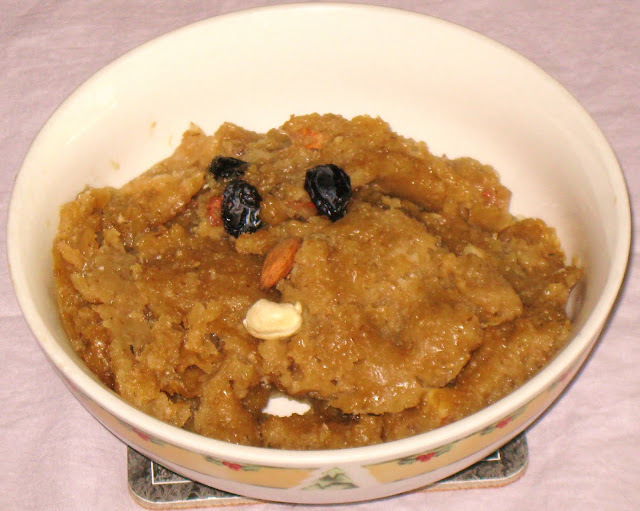 Remove from the pressure cooker and when it is hot, add jaggery, ghee, grated coconut, dry fruits and elaichi powder. On a low flame cook for some more time till all the jaggery melts and it is steamed well. This is Gauri's first entry for the WYF: Breakfast event hosted at this blog.. I was thinking we have been eating urad dal uttapam always. 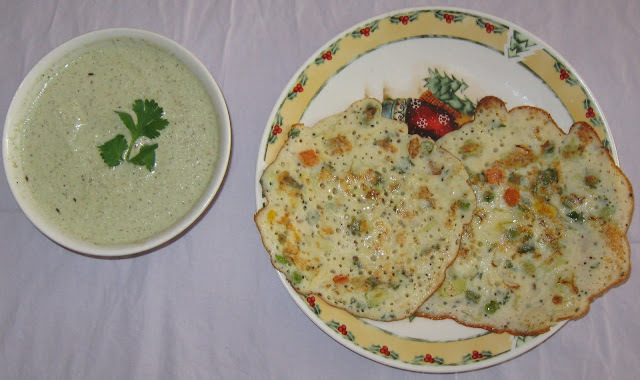 What happens if we mix some dals and make a uttapam with veggies which kids normally dont eat. This is a very nutritional breakfast with the dals and all the vegetables. 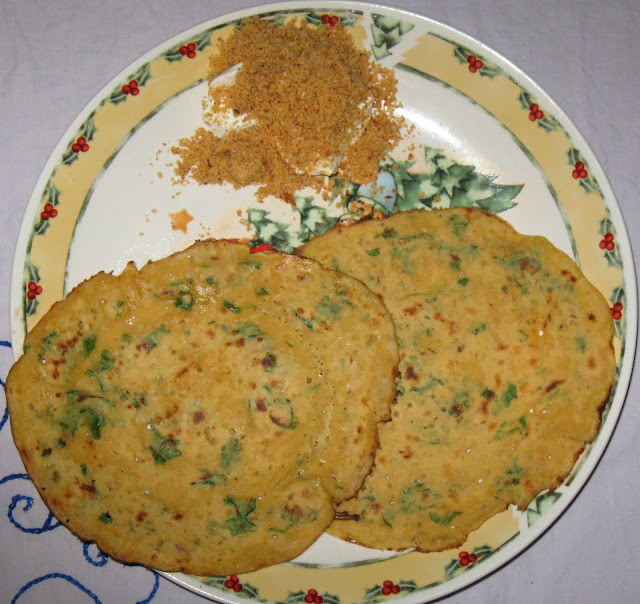 So one fine day I made this for breakfast and saw that all the uttapams were over. Check out the recipe. We dont eat onion so I haven't added any. If you like and eat, you can add cut onions also. Soak the urad dal and moong dal together with little methi seeds may be 4-5 seeds for about 8 hours and grind the dals to a smooth batter. Leave it overnight to ferment. In a pan add a little ghee, jeera and the mustards seeds. Wait until they splutter. Then add asafoetida, curry leaves, cut green chillies and crushed ginger. Fry well and add this seasoning to the fermented batter and mix well. Cook the vegetables of ur choice and add them to the batter. Finely cut some coriander leaves and add them to the batter. Also add some salt as per your taste. Mix the batter well. The batter should be like the dosa batter consistency. Heat the laddle and take a spoonful of the batter and pour it on the laddle. Do not spread it like a dosa - just move the laddle so that it remains thicker. 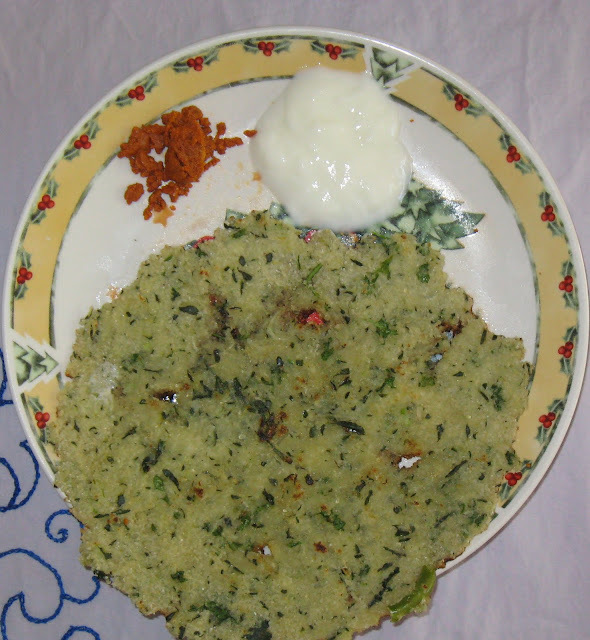 Spread some oil on the sides of the uttapam. Close the laddle with a lid. Then turn it on the other side and wait till the other side gets cooked. Take it out on the plate and spread some ghee if you like. If you dont apply ghee also it tastes good. This is the most easiest and the most nutritional breakfast. I love this khichdi for breakfast. Tastes very good and u can cook this quickly. My mother-in-law cooks this for breakfast most of the times and we all finish it in no time. The recipe is as given below. 1 tsp red chilli powder (if you like it less hot then add less red chilli powder according to your taste). Soak the moong dal and rice together for about 2 hours.Add little ghee in a pan. When the ghee becomes hot, add the mustard seeds. Once the seeds splutter, add asafoetida and then small piece of cinnamon, cloves and bayleaf. Fry them well. Now add the tomato pieces and once the tomato is soft and mushy add all the cut vegetables. Fry the vegetables well in the pan. Let all the vegetables get properly seasoned in the pan. Close the pan for about 2 min so that the vegetables are steamed a little. Now add the turmeric powder, red chilli powder and the kichdi masala. Finally add the moongdal and rice to the pan and fry it well. When once you start preparing this kichdi on the other side of the gas keep about 4-5cups of water for boiling. Now add the boiling water in the pan. Once water is added, add salt as per your taste. Close the lid of the pan and let the rice, moongdal, vegetables and the masala get cooked together. After 10-15 min check if everything is cooked well, put off the gas and garnish with grated coconut and coriander leaves. This is my favorite breakfast very delicious, nutrional, kids love it and really easy to prepare. The recipe is here for you. Take oil in a pan, add the mustard seeds and jeera. Once they crackle, add asafoetida. Now add the tomato pieces. Let the tomato get cooked and become soft then add the red chilli powder, turmeric powder and garam masala. Now add the cooked peas. Just cook for 2 min. Now add the coconut paste, add salt and jaggery and sprinkle the coriander leaves on top. Close the lid of the pan and let it cook for 10 min. Transfer to a bowl. Cooked Potatoes can also be added to the dish it adds more flavour. Sever hot with Bread or fulkas. This is a very delicious and nutrional breakfast. I cook this most of the times as my family prefers this breakfast and its their favourite. Here goes the recipe. Cook corn and grind it coarsely in the mixie. Now mash the potato. Mix the mashed potato and coarsely ground corn. Add red chillie powder, turmeric powder, salt, sugar, white roasted sesame seeds and coriander leaves. Mix all these ingredients well with the corn and potato. Now add the wheat flour till you get a chapati dough consistency. Now make round balls and roll into small paranthas. 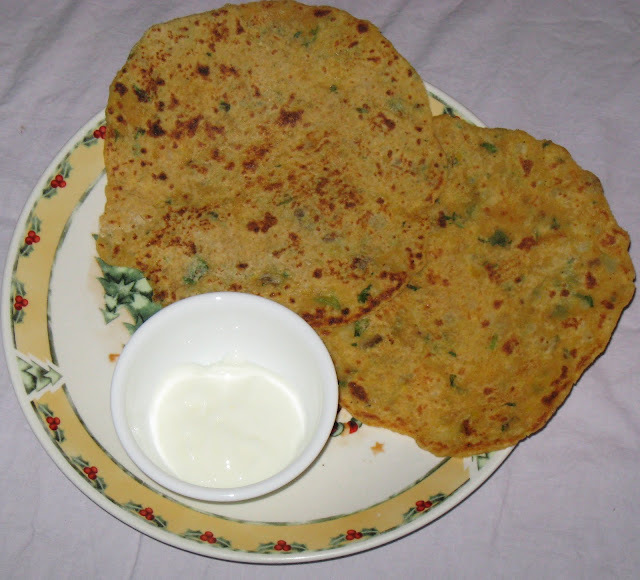 Heat the chapathi tava and fry the paranthas with ghee on both the sides till brown spots occur on both the sides. Dry roast the fenugreek seeds and rice. Roast the dals, coriander seeds, pepper seeds in oil, cool and grind to smooth powder along with fenugreek seeds and rice. Heat oil, add mustard seeds and curry leaves. When it splutters, add ladies finger, green chillies and fry for a minute. Add the tamarind extract, salt and let the vegetable cook. Add the masala powder and water as required and allow it to boil well. Thanks Naarisakhi for such a thoughtful gift..
Make a soft dough of maida, salt, ghee and water. Keep covered for 1/2 hour. Make small balls of it and roll it into medium thickness pooris. Make lines using a knife without cutting the edges like in the picture. Roll it and twist it a bit. Repeat for the rest of the dough and deep fry the pieces till crisp and golden brown. Heat the sugar with 1/2 cup water and allow it to come to soft ball consistency. (When you put a drop of the syrup in a small cup of water, you should be able to gather it into a soft ball)Add the cardamom powder and then the fried pieces to it and mix well. Transfer immediately to a greased plate and seperate the pieces. Dry roast the oats and powder it. Grind the soaked dal without water or very less water till smooth. Add salt, pepper powder and powdered oats to it. Make vadas and fry in hot oil till golden brown and crisp. Mix all the ingredients for outer cover and sprinkle water to make a stiff dough. Keep covered under a wet cloth for atleast 1/2 hour. Divide the dough into medium sized balls and roll out one of them. Cut in the center to get two pieces. Make cones from the pieces using few drops of water to seal the corners. Stuff the poha and press the corners to seal the samosa. Repeat for rest of the dough and stuffing. Make a soft dough of the ingredients except cumin seeds and ghee. Use lukewarm water to make the dough. Keep aside for one hour. Make medium sized balls of it. Roll the balls into thick chapati, spread ghee and sprinkle some cumin seeds over it. Cut it from the center and roll it like a cone. Press it to get a round shape. Now roll this into thick paratha and cook on hot tava without any ghee. Repeat for rest of the dough. Before serving, heat 1 tbsp ghee in the tava and fry the parathas on both sides..Add more ghee as required to fry all the parathas. Spread tomato ketchup on bread slices. Spread cooked maggi on one slice and cover with another slice. Be generous with the ketchup on bread slices as it gives an excellent taste to the sandwich. Keep the bread slices in a toaster and cook till done..
Powder the roasted oats first seperately and then grind it with other ingredients adding water as required to get a smooth consistency. Temper with mustard seeds, blackgram dal, cumin seeds, curry leaves and red chillies. Wash and clean the eggplants with a cloth. Make a cut in "+" sign to the lower side of the eggplants. Heat oil and place the eggplants on it and cover with a lid. Cook till soft slowly turning the eggplants once in between. Keep aside. 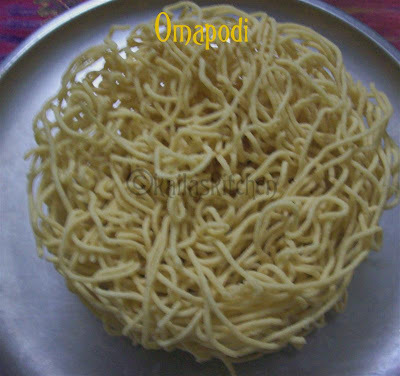 Fry the onions, coriander seeds, poppy seeds, sesame seeds and dry coconut powder seperately and grind along with the peanuts to a smooth paste adding little water. Add red chilli powder, jaggery, turmeric and dry mango powder and keep aside. Heat 1 tsp oil, add mustard seeds and cumin seeds. When it splutters, add asafoetida and curry leaves. Then add ginger paste and masala paste. Cook covered for 2-3 minutes. Let it cook uncovered for about 10 minutes and then add water as required for gravy. Add salt and allow it to boil. Finally add the eggplants and allow the gravy to blend well by cooking for about 10 mins. Cut the carrot into small pieces and cook them. The cooked carrot should not have any water, it should be dry. Meanwhile, soak the two dals and red chillies in water for about an hour. Grind them coarsely. In a nonstick pan, heat the oil, add mustard seeds and then the dal paste, salt, asafoetida. Roast well till it the colour changes and it becomes grainy. Add the cooked carrot and mix well. This is the probably my first recipe with this huge list of ingredients and a lengthy process..But the taste of this dish is out of the world..
Soak rice for 10 minutes and cook with the rest of the ingredients in List 1 and 4 cups of water. Spread on a plate to cool and seperate using a fork. 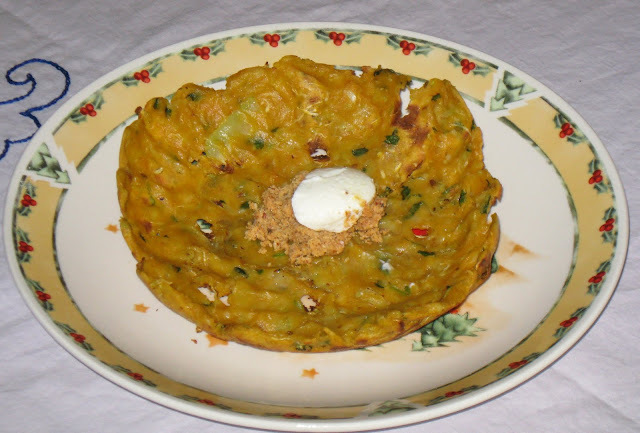 Mix the ingredients of gatta and make a dough of it. Make balls and roll it into chapati. Roll it tightly and stick the end with a drop of water. Repeat for rest of the dough and cook these rolls in boiling water for 10 minutes. Drain water, cool and cut into 1 inch pieces. Fry them in oil and keep aside. Add fried onions, cashews and raisins to the rice and divide it into three portions. Temper mustard seeds, asafoetida and sesame seeds and put it in a round thick kadai. Spread one portion of the rice, then one layer of the masala, again rice, masala paste and finally the last layer of rice. Sprinkle a little milk and cook on low flame for 5-10 minutes. Invert on a tray and garnish with chopped coriander leaves. Serve with curd, pickle and papad. Make soft dough of the flour, salt and water. Add oil and mix well till dry. Keep aside for 1/2 hr. Heat ghee and add the potatoes. Fry them for 2-3 minutes till the ghee starts seperating. Add sugar, cardamom powder, food colour and mix well till it gets thick and forms into a big lump. Make small balls and keep aside. Make balls of the maida dough and pat it to small and thick rounds using little oil. Use a greased plastic sheet for this. Keep the stuffing in the center. Cover it with the dough from all sides and dust it with little maida. Roll it slowly into thick chapati ensuring the stuffing doesnt come out much. Thanks all of you for participating in the event with your favourite Fried snack.. Mix all the ingredients for outer cover and sprinkle water to make a stiff dough. Keep covered under a wet cloth for atleast 1/2 hour. Divide the dough into medium sized balls and roll out one of them. Cut in the center to get two pieces. Make cones from the pieces using few drops of water to seal the corners. Stuff the maggi and press the corners to seal the samosa. Repeat for rest of the dough and stuffing. Mix all the ingredients except soda and keep aside for an hour. Add the soda, mix well and pour a drop of ghee in each depression of the paniyaram pan. Pour this batter andd cook on very low heat till done on one side. Slowly turn and cook on other side as well.